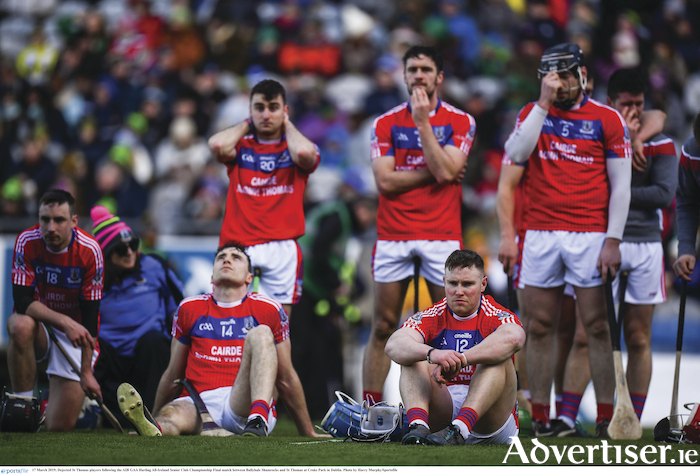 Dejected St Thomas players can only watch the celebrations afer Ballyhale Shamrocks win the AIB GAA Hurling All-Ireland Senior Club Championship final at Croke Park in Dublin. The notion that the relative inexperience of Ballyhale Shamrocks’ young stars might be exposed in Croke Park was blown out of the water as the Kilkenny kingpins tore St Thomas’ to shreds in the second half of Sunday’s one-sided All Ireland hurling club final. Their main weapon was full forward Colin Fennelly, who struck two killer goals in the first half when the elements were in St Thomas’ favour, but there were also eye-catching displays from Adrian Mullen and Brian Cody, while TJ Reid was operating at his clinical best. The news that key forward Éanna Burke would not be fit to play for St Thomas’ was a big blow for a side not renowned for its strength in depth. Damien McGlynn was drafted in and had his moments in the first half, but once Ballyhale flexed their muscle each side of half time, the writing was on the wall. Conor Cooney’s well struck penalty on 11 minutes steadied the Galway champions after a nightmare start in which Fennelly’s fifth-minute major helped Ballyhale to a 1-4 to 0-1 lead. Cooney’s goal, after points by Bernard and Darragh Burke, made it a one-point game, but St Thomas’ defence was feeling the pressure, and they were never able to get their noses in front. After Fennelly flicked a spectacular second goal past Gerald Murray from close range, Ballyhale went in five to the good, and a blistering start to the second period was required if St Thomas’ were to launch a comeback. Darragh Burke did manage to open the scoring, but Ballyhale struck the next five without reply. A serious injury for Fennelly’s marker Fintan Burke, who manfully tried to play on in spite of his knee injury, disrupted St Thomas’ gameplan even further. The Galway men battled gamely, but they were simply outclassed in the closing 20 minutes. Ballyhale turned on the style all over the pitch and David Burke’s late goal was little more than scant consolation as Henry Shefflin guided his club to their seventh title in his first season in charge. St Thomas : G Murray; C Mahoney, C Burke, S Skehill; D Cooney, S Cooney, F Burke; J Regan (0-1 ), David Burke (1-0 ); D Sherry, Darragh Burke (0-7, 0-5fs, 0-1 ‘65 ), B Burke (0-1 ); B Farrell (0-1 ), C Cooney (1-0, 1-0 pen ), D McGlynn (0-1 ). Subs: M Caulfield for F Burke (48 mins ) C Fallon for Regan (52 mins ) C Kelly for Sherry (56 mins ) D Finnerty for McGlynn (59 mins ).